Looking for sources of free colors to paint a house with? Keep reading to learn where to find interior and exterior home paints that don't cost you a dime. When you need some new colors to paint a house, paint stores are not always the best or only place to look. So if you are on a tight budget and not too picky about what colors you get, consider re-using paints instead of buying new ones - not only will you save money, but you will help save the environment as well. 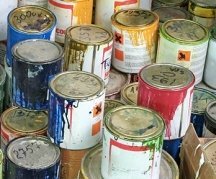 Stop by your local recycling center or a hazardous household waste facility - they collect unwanted paint leftovers from homeowners and businesses in the area, and allow anyone to come and get the paint for free (it's one of the things they do to keep the stuff from going to the landfills). 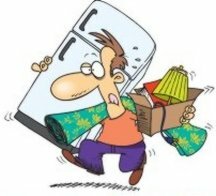 Another option is FreeCycle.org - if you register there (it's free), you will get access not only to no-cost house paints, but also to furniture, home decorations and many other free resources in your local area. Members of this site are people who don't like to throw things away if they can still be used in some way by somebody else (as is, with some repair, or for parts). So they give things a second life by passing them on to others directly. To find some free paint colors for your project, simply post a request on their bulletin board and someone in your location will respond with an offer (sometimes within minutes). Or you can browse their listings of existing offers to see if anyone is already giving away some interior or exterior home paints. Check your nearby paint and hardware stores - in addition to selling mistinted paints at a huge discount, sometimes they have a few cans available for free. And don't be afraid to ask around: your friends and neighbors, your church, etc. - a lot of people will only be happy if you come and take some of their unwanted paints off their hands! When it comes to paint colors, people's tastes change, or they decide they want to try something different this time, or they simply forget they have the extra paint stored away and buy a new gallon. As a result, almost everyone has a garage or basement full of paint cans, some even unopened. Many people have accumulated enough leftovers and unused paints over the years to paint an entire house. House paints can't be stored forever, so don't be shy about offering to lighten up your friend's stash - most likely they will thank you, because now they don't have to deal with paint disposal issues. And these days, when even our grandmothers are on Facebook and Twitter, sending your request out to the world and getting what you need has never been easier. Sometimes the best place to look when you need some free colors to paint a house is inside your own garage - chances are, just like most people, you too have many unfinished cans of paint left after all your painting projects. 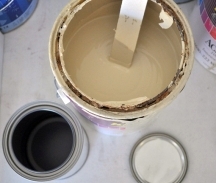 You may think that you only have enough for touch ups or just for painting a small room at best, but you can actually mix some of your paint leftovers together (especially those in similar colors - for example, cream, gold and beige) to produce enough paint for a bigger project. As far as those leftover colors that you don't have anything to mix with (to increase the amount of paint), they may still be enough for painting wall stripes (with a combination of 2 or 3 colors), or an accent wall - use your imagination! And if you have enough paint but just don't like the color, you can shift and adjust it more to your liking with some craft colorants, so that you will finally be able to use it (see How to Mix Custom Paint Colors to learn how to do that).